You can store music right on Apple Watch, then listen to it on Bluetooth headphones or speakers without your iPhone nearby. Pair Bluetooth headphones or speakers. You need Bluetooth headphones or speakers to listen to music on Apple Watch. Follow the instructions that came with the headphones or speakers to put them in discovery mode. When the Bluetooth device is ready, open the Settings app on Apple Watch, tap Bluetooth, then tap the device when it appears. Store songs on Apple Watch. Open the Apple Watch app on iPhone, tap My Watch, go to Music > Synced Playlist, then choose the playlist of songs you want to move to Apple Watch. Place Apple Watch on its charger to complete the sync. When the sync finishes, you can open the Settings app on Apple Watch, go to General > About, and look under Songs to confirm the number of songs copied to Apple Watch. Use the Music app on iPhone to create a playlist specifically for music you want to listen to on Apple Watch. Play songs stored on Apple Watch. After you pair your Bluetooth headphones or speakers (see above), open Music on Apple Watch, firmly press the display, tap Source, then tap Apple Watch. 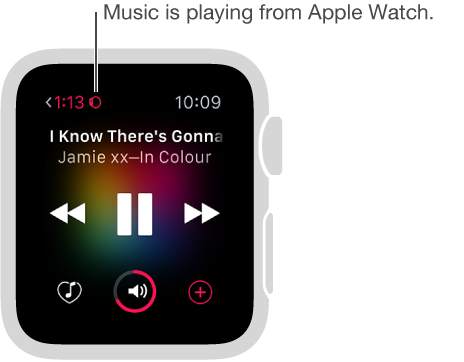 You can also scroll to the top of the main screen in Music, then tap the watch icon. Control playback. Swipe to the Now Playing glance for quick control. Swipe up on the watch face, then swipe to the playback controls. You can also control playback using the Music app . Limit the songs stored on Apple Watch. Open the Apple Watch app on iPhone, tap My Watch, go to Music > Playlist Limit, then choose a storage limit or maximum number of songs to be stored on Apple Watch. See how much music is stored on Apple Watch. On Apple Watch, open the Settings app , go to General > About, and look under Songs.